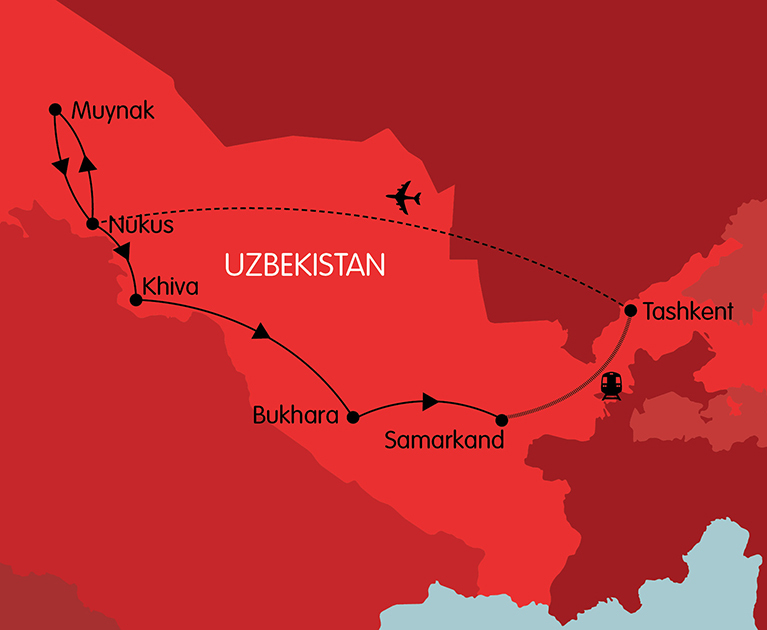 Enjoy a 13-day journey to one of the most fascinating destinations in Central Asia, Uzbekistan. This trip will start in Tashkent where you will visit a various range of mosques, well-known by their impressive architecture. Admire the fine arts of the locals, take a stroll through some of the oldest towns in the world and explore Uzbekistan’s diverse landscape including the boundless nomadic steppe. 1 Oct 2019 departure, subject to availability. Surcharge applies for other departure dates. Arrive in Tashkent where your local guide will be waiting for you to transfer you to your hotel. Start the day with a lovely breakfast at the hotel before a city tour through Tashkent, the capital of the Republic of Uzbekistan. Visit the Khasti Imam Complex consisting of a various range of mosques and the museum of ‘Quran’ where the second biggest Ottoman’s Quran is presented. Continue onwards to the Museum of Applied Arts of Uzbekistan and the Museum of History for a visit after which you can take a stroll on the Independence square to see the monument for Amir Timur. In the afternoon, you will head to the domestic airport for your flight to Nukus. Upon arrival, you will be transferred to your hotel. In the morning, there will be a drive from Nukus to Mynak, a former sailor city located near the Aral Sea. On your way to this city, you will have a stop at the symbol of the city, the monument of a boat. At the main port of the city, sailor ships are coming in and out to catch some fresh fish or bring it back ashore. Continue onwards to a former port now called ‘Cemetery of Ships’. The Aral seashores have moved away from this port over the years and the 100km of land in between turned into desert, leaving the ships on the ground. After viewing the ships on the desert, drive to the Moynak history museum to get an introduction on the expositions showing what the city looked like before the ecological disaster. Afterwards, you will head back to Nukus. Enjoy your breakfast at the hotel before heading to the Museum called ‘Louvre of Desert’ showcasing over 90.000 exhibits including a collection of Russian avant-garde, the fine arts of Uzbekistan, folk and applied arts of Karakalpakstan and the art of Ancient Khorezm. Even the world-famous Russian museum in St. Petersburg and the Tretyakov Gallery in Moscow recognise their envy towards the collections of this museum. After this impressive museum, you will head to the Mizdakhan Cemetary famous for its great number of monuments. This ancient cemetary was built in the immediate vicinity of the ruins of the ancient settlement of Gyaur-kala, meaning ‘fortress of the infidels’. Continue onwards to the Mausoleum of Maslumkhan-Sulu, originally located underground. Over time, most of its elements were destroyed and reconstructed on the surface, but the inner part of the mausoleum remained virtually untouched. On your way from Nukus to Khiva, you will drive through the desert and visit the old fortress of Ayaz Kala. The process of building this fortress began in the second century AD when the lands of the Kushan Empire were widespread. Upon completion of the construction, the fortress became an integral part of the border system, stretching from the eastern and western borders of the state. Afterwards, you will head to Toprak Kala which is the hillfort belonging to the list of the most important historical and cultural monuments of the city of Khorezm in the first and fourth century of our calender. Upon arrival at the ancient city of Khiva, you will be transferred to your hotel. Today you will be exploring Khiva. Its historic heart is preserved in its entirety, splitting the city into two parts: Ichan Kala (the inside town) and Dishan Kala (the outside town). Your city tour will start with a visit to the Kunya Ark Citadel which is the old fortress founded in the 1680’s by Muhammed Arang Khan. This citadel presented a complex containing the residence of Khivan Khans and their families. Pay a visit to the Palace of Nurullah-bai and the Tash Hauli Palace after which you will go to the eastern gates of Ichan-Qala called Palvan-Darvaza. In the 17th and 18th centuries, this place was occupied by the ancient gates with a prison. Afterwards, a visit to Madrassah of Muhammad Rahim Khan and the Madrassah of Muhammad Amin Khan is scheduled among others. Continue to the old fortress of Kunya-Ark, forming a city in a city with its high walls. End the city tour with the Minaret and Madrassah of Islam Khodja as well as the Friday Mosque before heading back to your hotel. Enjoy your breakfast at the hotel before driving to Bukhara via the Kyzyl Kum Desert. For centuries, this has marked as the northern limits of Transoxiana and the edge of the boundless nomadic steppe. Along the way, you will see the Amu Darya, one of the largest rivers of Central Asia separating the Kyzyl Kum from the Kara Kum of Turkmenistan. Have a picknick along the road after which you will continue your drive to Bukhara where you will be transferred to your hotel. 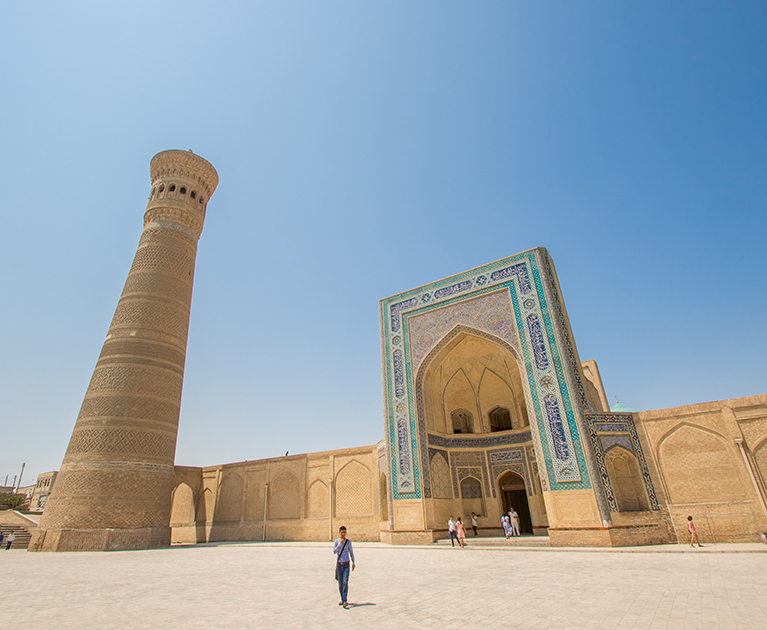 Ready to explore Bukhara? This is one of the best places in Central Asia once known as the capital of the Samanid state. Here, you will visit the ARK fortress which used to be a town with the emirs house, mosques, government institutes, storerooms, a prison and a square for public executions. A visit to the Bolo Khauz Mosque, Samanid’s mausoleum and the Chashma Ayub Mausoleum is planned as well as the Pokalon which is an architectural ensemble in the centre of the old Bukhara. After lunch, a visit to the most elegant trade halls in Bukhara awaits you after which you will visit the Trading Domes consisting of three trading centers. Round off your day with a folklore show at Madrassah Nodir Dewon Begi. Start the day with a visit to Sitorai Mokhi-Khosa, the former summer residence of Bukhara’s last emir. This is a unique site combining Oriental and Russian architecture. Continue to the mausoleum of the founder of Sufi Muslim order Bakhouddin Naqshbandi and Chor-Bakr Necropolis. Five kilometers to the west of Bukhara, where the fields are separated by rows of mulberry trees, there is one of the most unusual landmarks, the Chor-Bakr Necropolis. The first graves there appeared thousand years ago, when there was a small settlement of dervishes. Afterwards, return to Bukhara. Drive from Bukhara to Samarkand via Shakhrisabz which is the birth place of Amir Timur. Visi Ak Saray, Timur’s summer palace, Kuk Gumbaz Mosque and the Dorut Tilovat Complex in Shakhrisabz. While being here, there is also a visit scheduled to the Gumbazi Seydon, the Dorus Saodat Complex and the Hazrat Imam Mosque. Head onwards to Samarkand where you will be transferred to your hotel. Mausoleum, a unique monument of architecture with a blue ribbed dome. Continue onwards to the Registan Square, the official centre of the Timur Empire consisting of the Bibi Khanym Mosque, the beautiful mosque constructed by Timur for his wife. After lunch, a visit to the Oriental Bazaar is planned which is the oldest bazaar of Samarkans where Caravans of the Silk Road stop to trade. End your sightseeing with a visit to the Shahi Zinda Mausoleum and the Ulugbek’s Observatory before heading back to your hotel. Enjoy your breakfast at the hotel before heading out onto the streets of Samarkand where you will start with a visit to the Mausoleum of Saint Daniel’s, the Museum of Afrasiyab and the ruins of the old city of Afrasiyab. Continue onwards to the paper production mills where the old technologies of ancient paper production are shown. The whole process is carried out manually and every guest may watch the process. Head to ‘Hudjum’ where you are allowed to observe the process of producing handmade silk carpets. Afterwards, you will be transferred to the train station and take the high speed train to Tashkent. You will be transferred to the airport where it is time to leave Uzbekistan behind and head back home. Advertised prices are person twin share, cruise only and correct at time of publication and are subject to availability and change at any time without notification due to fluctuations in charges, taxes and currency. Offer is valid on new bookings only. ^Bonus is included in the advertised price. Minimum two travellers required for the tour to run and maximum nine people. Hotels can change according to availability. Deposit is non-refundable and final payment due 95 days prior and non-refundable at full payment. Other conditions apply. Please contact your personal travel manager for full terms and conditions.